In the final match of the season Darts entertained Tottonians who had unfortunately been relegated and it was a good start for the home team. The Darts scrum was again very solid pushing the visitors back despite a big difference in size between the two packs and it needed a good clearance kick to keep Darts at bay. Totts were looking sharp and were playing with freedom which pushed play into the Darts 22 but Jonny Regnier was able to clear the threat with a 60 metre kick to touch. The visitors turned over the ball and went on the attack but tenacity from the home team won the ball back and quick hands moved the ball to James Burton on the wing who was well tackled but a great offload in the tackle allowed Jonny to take the ball on and score the first try and add the conversion. 7-0. Play went through a period with both teams stuck between the 10 metre lines and then a great break saw the Totts full back sprint from half way towards the line only to be tackled by Ollie Edwards who stopped an almost certain try. Totts were getting into a good pattern of play using forwards and backs to great effect and forced Darts to concede a couple of penalties which they ran. Good defence from Darts stopped the threat and launch play forward towards the Totts 22. There was nothing at this stage to suggest that Darts wouldn't be able to build on their lead and end the season with a win however after some excellent phase play a loose offload allowed Totts to counter and after a couple of good drives they had created a good overlap to score a well deserved try. 7-7. Darts were conceding a number of pens and making small errors which put Totts on the front foot and this forced a penalty in front of the post which was converted to give the visitors a half time lead of 7-10. The second half started well for Darts with a good linout and a 40 metre rolling maul which took play deep into the opposition 22 but again a silly penalty allowed Totts to clear their lines. The Totts fly half as having a good game keeping Darts pinned in their own half with some accurate kicks. Whenever Darts broke out they either made a small error or gave away a penalty, from one of these Totts kicked for touch and Darts just fell asleep and allowed the front player a free ball and stroll over from 15 metres. 7-17. Although the Darts scrum was dominant they were being penalised for various offences and from one of these Totts extended their lead to 7-20. Darts were trying hard to get back into the match but despite some great breaks the visiting defence was strong and the confidence in the Totts team was evident in the way they were playing for each other. James Burton was now at his favoured position scrum half and was getting Darts on the front foot but when he was taken out at the back of a ruck it looked like Darts could make ground but they again were penalised and this gave the Totts the chance to extend the lead again to 7-23. Darts continued to work hard and put pressure on the visitors however it looked like it was one of those days when nothing was working for the team and each time Totts had the ball they made something out of it. A disappointing end to a very tough first season in London 1 but the team should be extremely proud of the way they played throughout the season and now can look forward to a deserved rest ahead of preparations for next season. 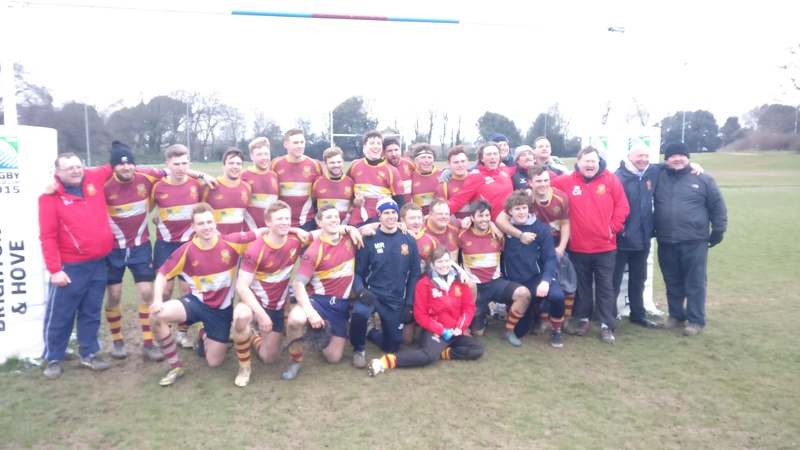 A shame to see Totts out of the league as they play some great rugby with great spirit and were great fun to be with in the bar after the match and we wish them luck next season in their efforts to bounce back. Player of the match was James Burton who adapted really well on the wing and then showed his ability at scrum half when Danny Taylor had to leave the field.